I know we’re only a little over 24 hours removed from Tiger’s unexpected Tour Championship win, and much has already been written and said. 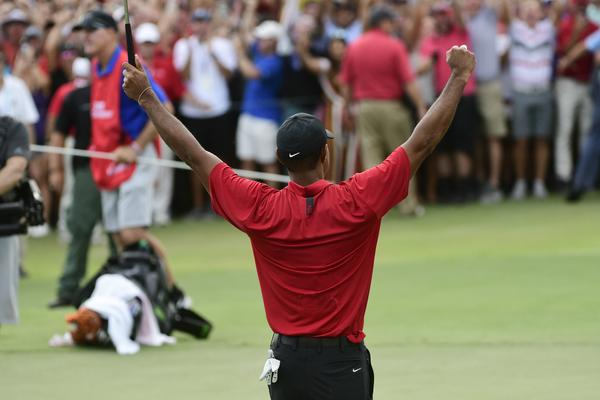 Many of you likely have no interest in golf, but Tiger’s remarkable win yesterday is not about golf, it’s about redemption. I enjoy golf, and I’ve always enjoyed watching Tiger’s dominant, skillful play. I still remember where I was (in the Denver airport) when Tiger won his first Master’s in 1996; and many of us can certainly recall that fateful Thanksgiving in 2009 when suddenly the world seemed captivated by the drama of his black Escalade crashing into a fire hydrant amidst reports of his traumatized wife lashing out with a nine iron. Tiger’s secret sexual brokenness was splashed across global headlines apparently driven by media greed and public voyeurism, alongside seemingly no thought of kindness and care for Elin, Sam, Charlie or certainly Tiger. It was only two quick months later, Super Bowl Sunday 2010, when my own hidden secrets of sexual betrayal and brokenness were clumsily disclosed. Suddenly, while the rest of the world still seemed to be sadistically feasting on the news of Tiger’s downfall, I found my family and myself buried under the violent collapse of my own house of cards. The dark, ugly secrets I’d finally let out quickly swallowed my family and me in a heartbreaking slough of trauma. I voluntarily–but not thoughtfully–offered my most shameful secrets, sincerely–though naively–hoping they would lead to greater intimacy and freedom. Sadly, it proved to be the beginning of the end. On that cold, lonely, and devastating day in early February, I felt a measure of empathy and compassion for Tiger. Voices like mine that desired to speak and hearts like mine that hungered for words of grace, kindness, and compassion felt like the minority being shouted down by the beast of public opinion eager to bask in the hollow plunder that was the tragic downfall of a rich, famous athlete. When we experience a “fall from grace”, our shame tempts us to believe that we are too broken, too despicable, too perverted to be loved. It’s like this haunting, omnipresent voice reminding each of us, I am unworthy and undeserving of any goodness or kindness…from anyone. It’s a lie straight from the pit of hell, and we need to send it back from whence it came! You, me, not one of us is EVER too far gone that the grace, love, and redemption of Almighty God, our Abba Father reaches beyond to offer us rescue and hope. And that’s what Tiger’s win yesterday reminded me of. On behalf of every man and woman who has fallen, Thank You & Congratulations, Tiger! Previous Post: « Theme Song !